Brian radically changed the configuration of the room. The chairs were moved and placed at carefully selected intervals. The room was lit by desk lamps also selectively placed. Timber lengths were piled in one corner while Declan’s mirror was moved to face into the space, providing a frame to Brian’s scene. Two tables were the main areas of action, the rising table and a second ‘workmans’ table. The audience were free to wander the room and consider the different objects and images. The two tables demarcated two areas of action, the workman’s for intricate engagement with a scorched atlas, compass, knife, pages of text (the universal declaration of human rights). An intense and introsepctive ritual-like process resulted in the text being crumpled into balls and thrown around the gallery. Images of the war in Afganistan were transferred from the table to the timber lengths (like flags) which were then used in the second area of work, the rising table. This rising table was installed in the middle of the room with a silver tray laid on top inside of which rolled a large silver ball. 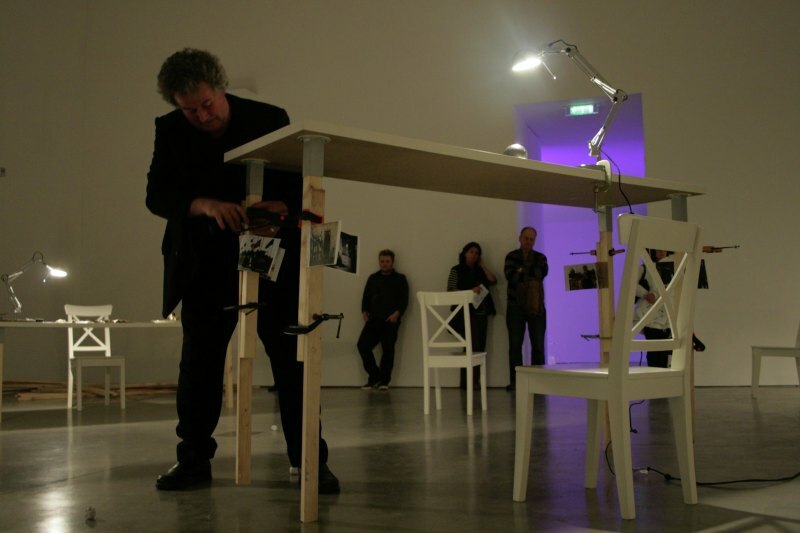 Here Brian slowly extended the legs of the table, drawing on his increasingly tall lengths of timber, making the process more difficult and unstable as he went along He methodically released one leg of the table, allowing it to hit the ground, and inserted the new longer plank of wood. Holding the table aloft with his head, like Atlas, while he raised the table. The silver ball and tray rattled with the instability of the rising table. All of these actions were made with a slow steady, concentrated energy. The table rose to beyond six foot, making the final adjustments only possible from the top of a ladder. The table swayed freely with the instability of its height. Throughout the day he shifted back and forth from these two acitivites. Brian left the room with his precarious raised table supported by the wooden ladder. The back of each chair was slotted with the flag like planks of wood, the intermittant lenghts of the table legs.